Designed to displace as much water as possible, the V&M Wild Lizzie provides more thump and more vibration than any other lizard on the market. The 6.5” is built with a slender lizard body, numerous curled appendages, and a razor-thin tail. 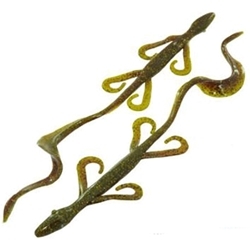 The design of the Lizzie 9.5 includes a lizard body with a thick spined razor thin tail. The V&M Wild Thang Lizards move massive amounts of water and have a versatile profile that comes to life with a number of different techniques.